1. Wine. Usually I select one of my favorite red or white wines to take as a gift. But sometimes a port or a dessert wine is a nice change. 2. Fresh Flowers. This is always a safe gift. But other options are also fresh herbs or plants such as orchids or fresh cut basil. 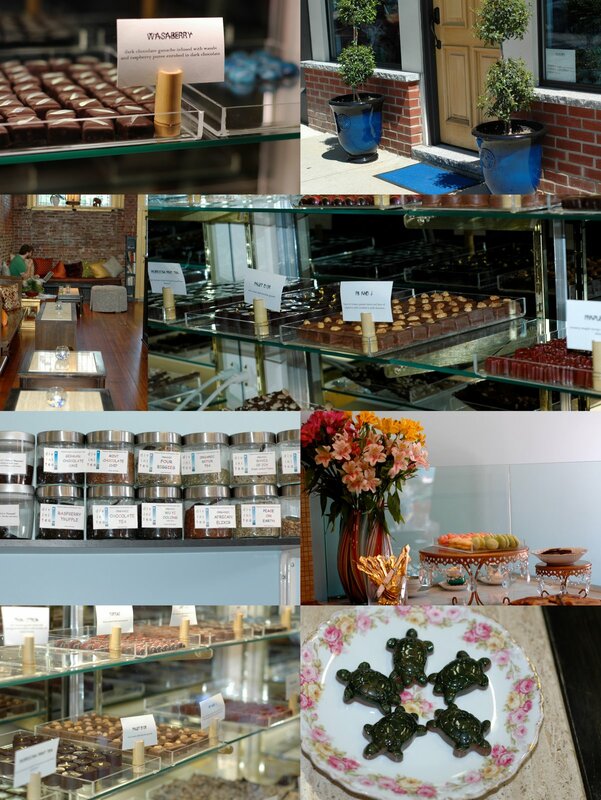 I just heard about this new chocolate cafe in South Boston called Blue Tierra Chocolates. Blue Tierra specializes in handcrafted chocolates, pastries, and desserts. They truly are unique because they use natural ingredients and everything is fresh. At Blue Tierra, they even use local and organic ingredients when possible. They also serve loose leaf tea, origin coffees, and coffee elixirs. And the truffles are infused with spices and flavors from all over the world. Blue Tierra serves this amazing chocolate called Wasaberry, which is a dark chocolate ganache infused with wasabi and raspberry puree enrobed in dark chocolate. And did you see those adorable green turtles? They were so delicious! What is your favorite "go to" hostess gift?